Because I'm sick of studying. *stares at Consumer Behaviour Notes* So, I watched Saki Ep11 \O/ I love this part and I like this particular dialogue I got from the Saki Ep11 thread in yamibo lol. Captain (Mihoko): You heartless jerk, why did you leave our home, abandoning me and our kids!? Edit: Oh wait I got another one. Captain (Mihoko): You heartless jerk, how dare you leave me after you knocked me up!? Buchou (Hisa): You do know I'm a girl right? 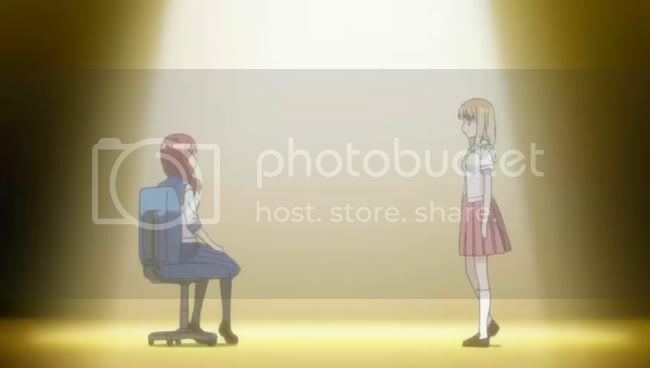 In the Next Episode of Saki ... (Cue Dramatic BGM): Buchou With A Mystical Third Leg!? Or something like that LOL. Anyone else with better dialogues for that particular scene while we await Ep12? hm? it continues into ep 12? cliffy or something?
? No, it's just a dialogue of my own imagination, lol. Hisa sounds like Nao from Mai Hime in ep1.. Probably should've asked beforehand. Sorry 'bout that. ._. If you imagine Mihoko with a sad face rather than an angry one while Hisa is looking at her shocked or something. An effective one! Art is always appreciated. I really can't wait to watch episode 12. I really 100000000000000x am excited to watch it. Sad to say, I have only read up to chapter 17 of the manga since it is the only latest chapter that came up scanlated. Well, Sunday in Japan (which is today) is the showing of episode 12 right? I wish fansub groups can sub as fast as hell. AND... I want Hisa x Mihoko to happen no matter what!!! AND YOU AKAYUKI-SAN... You influenced me in pairing Hisa x Mihoko up! Actually I never thought of them but when you mentioned it, I see them as a more interesting pair since Saki x Nodoka is already obvious. That's why I am aiming more for those non-obvious possible pairs. LOL! But what do you think akayuki-san? Since I assume you've read the latest chapters of Saki, did some development between Hisa x Mihoko happen? Just spoil me even it's just a bit. But I don't know if spoiling me would hype me up to watch even more. LOL! to L4000M, haha me too, I can't wait for the subs to come out =w=. Hmm I've not downloaded the raw, I wanna keep my quota for the subs lol however, I saw the screenshots for Ep12 in yamibo, seems like GONZO yurified the meeting scene between Hisa and Mihoko =D. In the manga, Mihoko merely casted a glance at Hisa (there are no flashbacks or anything about what happened in their last game) and Hisa went '??? She looks familiar kinda expression' and that's all. As mentioned earlier, GONZO (GOOD JOB), yurified that flashback, throwing in their own rendition of what happened (moments of flirting words and blushes *_*) after the game between Hisa and Mihoko =D and I'm not complaining hehe. And eh, there are no further development between Hisa and Mihoko after that =( cos everything focused on Nodoka and recently, Saki's match with Koromo. Hey you know what, I just felt that if only Hisa had money that time and went to Kazekoshi, Mihoko could have approached her and have become friends with her. Mihoko's flashback scene felt like she has like a love-at first-sight thing to Hisa. LOL! She even looked for her at her own school during her first year. I am gonna rewatch episode 11. Oh yeah and I recently just watched Saki episode 12 through MakiMaki subs. It was awesome with those yurified Hisa x Mihoko moments. Gonzo did a excellent job here indeed. It was truly a cute episode. Sheesh... I wish Hisa x Mihoko would be developed further. I really am craving for this pair no matter what. My heart really yearns for it. Well since the manga isn't finished yet, they might as well throw some Mihoko x Hisa moments as part of a filler chapter after the preliminary tournaments. LOL! Maybe Mihoko would even go to the nationals (if Kiyosumi would make it through) just to watch Hisa's battle or something. Oh no... I'm dreaming too much already. LOL! And hey akayuki-san, what volume of Saki manga is this cover from? I sure haven't seen that cover from the latest scanlated volume. So is Mihoko visiting Kiyosumi or what? Yuuki is there so I was curious. to L4000M, haha, I've got a feeling that Mihoko will find a way to talk to Hisa either after the competition or in filler episodes if GONZO likes it xD. They can't just leave us hanging after Hisa's comment/praise on Mihoko's heterochromia eyes as pretty as blue sapphires and red rubies in the flashback =A=. Come to think of it, Mihoko's right eye colour is not red, isn't it? It's more of ... brown-dish-orange or something. I feel that Hisa's more of the red ruby colour =D, maybe ... she's comparing/pairing herself with her? =O *thinking too much* hahaha. Hmmm, I think the focus will on the mahjong soon so I won't expect so much development on the Hisa x Mihoko pairing. Besides, there will be Momoko x Yumi later =O so yeah xD. And oh, that cover is from the manga Volume 4 and Hisa's on the other side of the cover which was conveniently left out? lol. Well, at least she's in my version of the cover (Chinese version). Well Gonzo shouldn't waste a potential couple there. (also stares at the mangaka) Hehe! Here I thought Hisa was referring to both of Mihoko's eyes but then, yeah... It's somehow brownish. Wow... Now Hisa's words really now have more impact on me. Damn that I wasn't able to notice it earlier. "Hmmm, I think the focus will on the mahjong soon so I won't expect so much development on the Hisa x Mihoko pairing." "Besides, there will be Momoko x Yumi later =O so yeah xD." Mmmmm... Momoko x Yumi. A Yurilicious pair to look forward too. (too excited) Sheesh... Too much pairs indeed. Love it but somehow made me confused whom to pair with whom. Just glad that I have researched even for a bit. LOL! "And oh, that cover is from the manga Volume 4 and Hisa's on the other side of the cover which was conveniently left out? lol. Well, at least she's in my version of the cover (Chinese version)." Just speculating here though... But my basis might be weak too. I felt stupid myself by looking at the Saki raws volumes 3, 4, and 5. (Really can't wait) I sure laughed at myself there when I got spoiled. Koromo sure is like scaring them off. I wonder if she's doing it on purpose? It's almost like she's black-mailing her opponents. That's what I had in mind when I saw the scenes. I'll just try to forget it by watching other anime or reading other manga. LOL! Well, I really guess that fillers will come after the prelims. I saw Momoko x Yumi and can't wait to read and comprehend what they actually said there. Saki -咲- Ep12 - WTF was that?